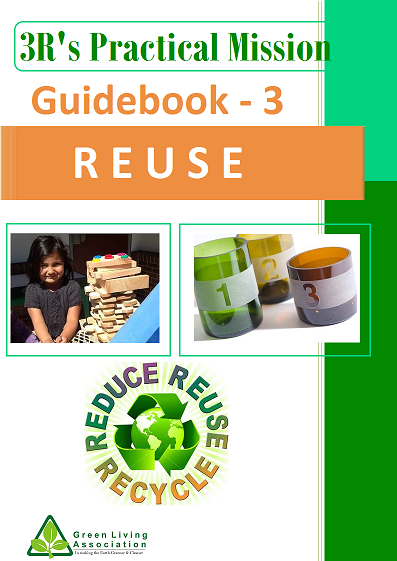 Schools have great stuff to be used in their 3R’s activities – from paper and computers to food and books. 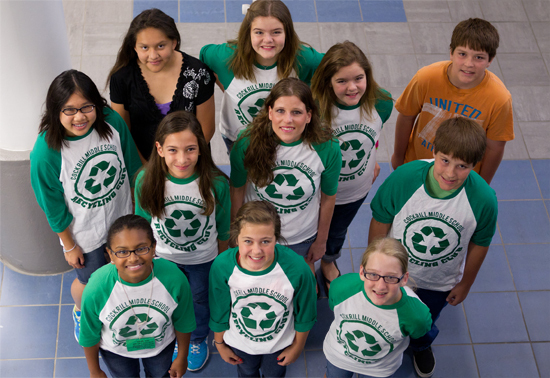 By learning how to properly handle this waste, school officials not only have an opportunity to greatly influence the future of their school and students but they can also have a significant impact on the environment. Under its five yearly campaign 'Collective Action to Restore Environment' ( CARE 2012-16), Green Living Association successfully ran complimentary (free) 3R's Practical Mission in the summer of 2014 to help the Green Angels and their schools discover how 3Rs (Recycle, Reduce & Reuse) can transform their lives by developing the habit of Environmental Conservation. The Practical Mission facilitated hundreds of schools and their campuses throughout Pakistan in the learning of distinguished practical skills of Environmental Conservation without involving Registration Fee. With their registration for once the Green Angels were allowed to participate in the entire project. All categories Guidebooks were available online on the websites of Green Living Association to help the Green Angels and their family members to comfortably study from their homes and conveniently attempt the Quiz. 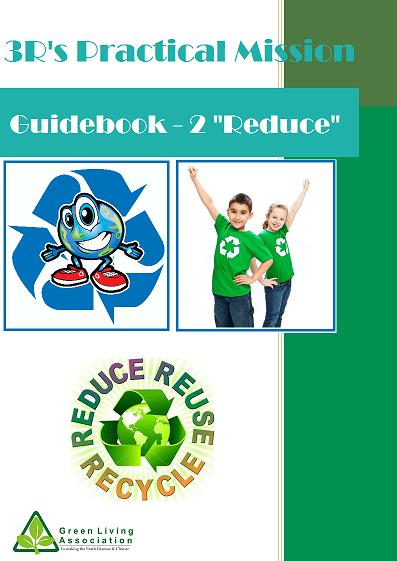 The category-wise Guidebooks were designed in consistent with the learning capacities of Green Angels in their respective grades. The standard of the Guidebooks’ contents was kept a bit higher to facilitate the supporters’ association with the Green Angels for their productive learning. What is 3R's Campus Project? Every day at our schools, homes and offices a large amount of recyclable material is thrown out and taken to the waste dumping sites and landfills. 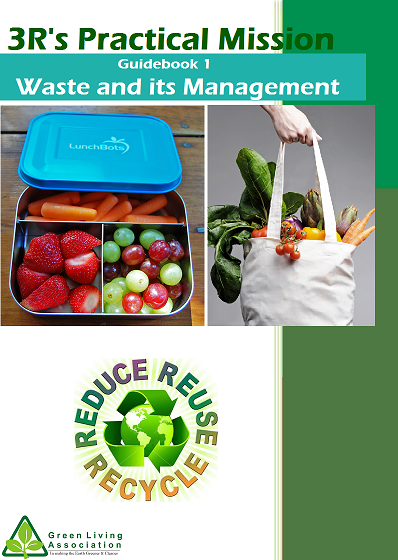 Half of all garbage in schools is generated during two hours – lunchtime. 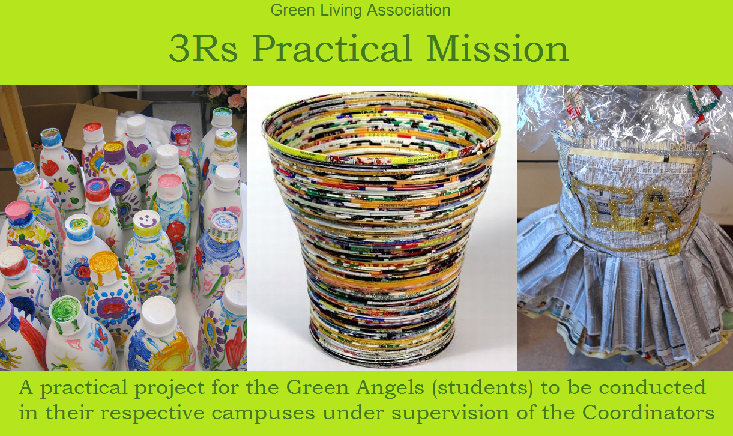 To successfully achieve the objectives of its practical campaign Green Ways (2012-16), The mission of '3 R's Campus Project' was to help the Green Angels (participating students), their schools' administration and their families discover how 3R's (Recycle, Reduce & Reuse) can transform their lives by developing the habit of Environmental conservation. After successful accomplishment of the 2 parts of the Project; 1.Study from the Quiz Guidebooks and 2. 3R's Campus Quiz, Green Living Association launched 3R's Campus Mission as the practical and last last part of the Project. The meticulous 3R's Project brought for the Green Angels and their families distinguished practical skills of Environmental Conservation in making our homeland Pakistan Greener and Cleaner. This will eventually contribute in making our beautiful world a more charming place for all of its inhabitants. By setting up a 3R's Campus Project in a campus, the Green Angels not only learn how to become Environment Friendly citizens but schools can also make major reductions in their waste creation with minimal effort. It’s really significant because Recycling benefits the air and water by creating a net reduction in ten major categories of air pollutants and eight major categories of water pollutants. Imagine, it takes 95% less energy to recycle aluminium than it does to make it from raw materials. 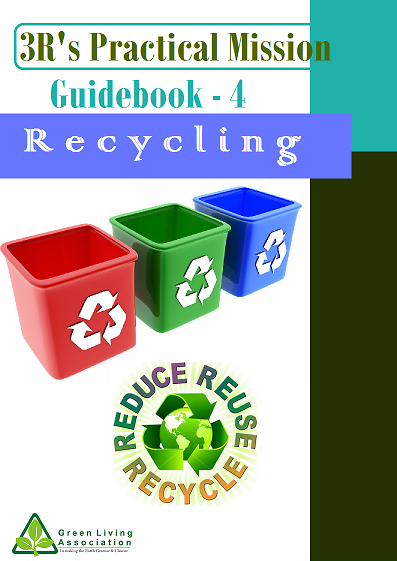 Making recycled steel saves 60%, recycled newspaper 40%, recycled plastics 70%, and recycled glass 40%. These savings far outweigh the energy created as by-products of incineration and landfilling.